5:2 Diet. 3.5 stars out of 5. Shred. The Revolutionary Diet 3 out of 5 stars. The Day Off Diet Plan: How Much Weight Can You Lose? 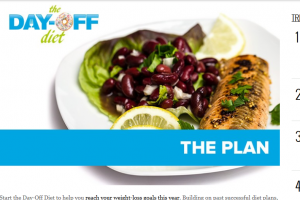 The Day Off Diet Plan was created by Dr.Oz and brought to the public in early 2016. Today you will learn what you need to know about it and how much weight it can help you lose and if this plan has any flaws. How does the Day Off Diet Work? 6 days out of the week, you will be dieting according to the rules set up by this plan, while on the 7th, you will be “taking the day off”. The day you select to “cheat” can be any day out of the week and this plan’s rules suggest you pick days when you have special occasions such as birthdays, holidays, long weekends. ect… and anytime where you feel like you may slip on your diet routine. In some ways, the Day Off Diet is a very specific style of paleo because you will be eating from a limited food list and the foods themselves will be very low in calories. Some of them have high satiety. You will be required to drink hot water with lemon before breakfast. A tea cup is fine. If you have allergies or can’t eat/drink lemon juice, you can either squeeze less juice and add more water for dilution or just not add it at all. If you aren’t allergic, squeeze enough lemon so that the drink is mildly sour. Lemon water does help clear out your digestive system before you start eating and it does help the body digest foods better and absorb nutrients. For meals, you will be eating 4 times a day: Breakfast, snack time, lunch and dinner. The rule book didn’t mention when you should eat each meal. I would suggest you eat before work, snack about 1-2 hours before lunch time, then have lunch and finally dinner which I suggest you eat a few hours before bed so you are hungry when you go to sleep. For breakfast: You can either eat your breakfast or drink a shake. For eating: You are allowed 1 egg with a serving of fruit and greek yogurt. For shakes, it’s a combination of banana and other ingredients. You can get the entire plan on the official site of this diet. For snacks, you are allowed to eat foods with healthy fatty acids such as avocado, nuts, walnuts and other foods with healthy fatty acids. For lunch, you are allowed to eat foods such as fish, chicken, eggs and even tofu, anything with protein with additional foods such as sweet potatoes, quinoa and green beans. Dinner is the same thing as lunch. Since that is your last meal of the day, if you do need to eat more of the portions aren’t big enough, you are allowed to add and eat as many extra vegetables as you like, but only during each meal. The vegetables must not have starch. Only very healthy foods are required to be eaten 6 days a week. Since it is a low calorie diet, you can lose about 2-5 pounds a week although there are no average weight loss results provided. The 2-5 pounds are an estimate based on the small portions. The shopping list isn’t big and since you’re not eating a lot, the cost for the foods isn’t big either. Very low calorie consumption may be good for people who have little weight to lose, but generally the portions allowed in this diet won’t be enough for a lot of people. Although you can eat more vegetables to make up for extra calories, it still isn’t easy. No specific long term plan provided. I doubt people will be able to continue this diet after several weeks. It’s just way too little in calorie intake. With the food list provided, there aren’t that many choices in delicacy foods, the only place you get more diversity is in the snacks. 3.5 out of 5 stars. For short term weight loss, this diet isn’t bad and it is very healthy to try. But this plan does NOT adjust to people of all ages and sizes. Some may need to eat more than the recommended food amounts to stay active and feel good. How well will the Day Off Diet work for you? There is no way this diet won’t work. It has to because you’re eating so much less and the foods themselves are too low in calories and healthy for it not to work. Most of this diet’s consumption is vegetables even though there are small portions of meats and eggs allowed and even some fruits (a little yogurt too). But this diet is hard to stick to. Based on the food lists provided, each meal may carry less than 500 calories which means your daily consumption might be less than 1,500 calories. Eating more vegetables, which is allowed may make up for deficits in hunger, but it’s not going to be easy. This diet is going to be easier to do for people who need to lose 10 pounds or less. There will be people for whom eating around 1,500 or less calories a day may be too difficult. I recommend that you stop eating at night and just substitute bad foods for healthy ones until you reach a weight where you can manage the Day Off Diet. Need to lose 10 pounds or more faster? Try the 3 week diet. In it’s first 7 days, you would be eating around the same way as you would with the Day Off Diet, but after day 7, it changes things up and these changes cause even more weight loss. After day 8, you can eat more flexibly. With the 3 week diet, there will be more food choices, there will be more weight loss (20+ pounds) and there is a long term plan available that any person can follow that you would not get with the Day Off Diet. I’ve seen Dr. Oz on TV a few times. He has some pretty good advice. I think this diet plan seems very familiar to calorie cutting. Which is not too much of an issue. It would work even better if a light workout was done, say, every other day. Then you would really start to see results. I could see this diet working for someone who is looking to fit into something by a certain date, like a wedding gown or a nice suit. I’m really needing to lose about 16lbs may be more if I’m totally honest. I will try this diet because I like the idea of being able to (pig out) at least once a week. Because my willpower is not so great and the occasional “treat” will help me get through the week. Thanks for the ideas. Hope I succeed. This diet is very low carb Donald, you might run into problems. I recommend the 3 week diet. Hey Vitaliy, good information you have provided here about day off diet. I am sure it can be prove a nice strategy for people who are looking for a short term weight loose plan. This is a very exciting new diet. I see now that it may not be for me because of its extremely low caloric intake and minimal variety in meal ideas. I am really glad that I stopped by though and had the opportunity to learn more about it. I look forward to finding the diet that is right for me. I disagree about it being exciting David, it’s just a limited and low caloric paleo diet. Which diet do you want reviewed? Would you like to the #1 recommended diet plan on our site? -It can help you drop 15-20 pounds in just 3 weeks. -It's one of the most powerful, natural diets there is. -It's excellent for dropping belly fat! -Very flexible (many food choices). Yes! Show me this diet plan!